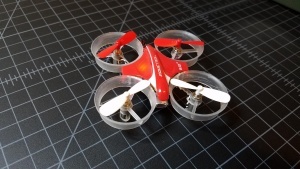 Here is a great RCG posting by ScottAllyn about Brushed Micro Motor & Prop Testing for Blade Inductrix / Tiny Whoop. I wanted to re-post it on my site just in case it ever goes away. I was looking for my little motor and prop testing post earlier today so that I could update it and ended up digging through a number of pages before actually finding it. I figured I’d copy the data here to this little RCGroups Blog section so that I don’t have to keep digging and if anyone else finds the information useful, they can find it more easily here, too! I’m treating this as a live document and I’ll post a reply to the thread when I’ve made significant updates. These tests are not scientific and the setup is pretty crude, but I think the results are useful. Decide for yourself and lemme know what you think. Just don’t be mean; I’m a delicate flower! The fixture pictured above is what I’m currently using for these tests; it’s permanently mounted to that scale. The scale measures grams with a resolution of 0.01g. I’ve found it to be accurate and repeatable down to ~0.02g. 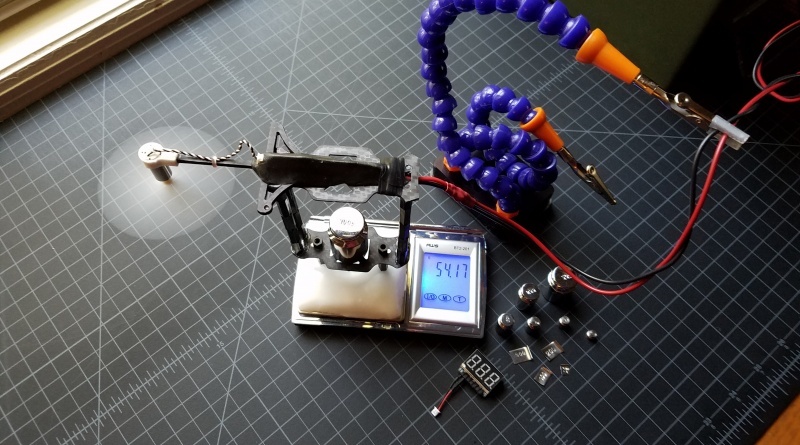 I was initially concerned that having the motor cantilevered out from the center of the scale like that might throw off the readings, but I’ve placed various calibrated weights on the motor mount, ranging from 0.02g all the way up to 65g and the reported numbers were spot on. The 100g weight helps dampen the fixture and stabilize the readings. The motors and props are oriented upside down so that the direction of thrust pushes the motor down into the scale. This allows the prop wash to go into free space and prevents it from hitting the scale (or getting recycled back into the prop) and wreaking havoc with the numbers. I use a laboratory power supply to power the motor(s) @ 3.70V. For each test, I run the motor at a lower fixed current for 20 seconds then at full speed for 5 seconds before I record the thrust and max current draw. Each test is run three times and the results are averaged. I always allow the motor to cool down before running the next test. I usually go back after doing all of the tests and do a couple of spot checks to make sure that nothing shifted during the testing. The motors used in these tests are new and have been set aside for the sole purpose of these tests. Each one is initially broken in by running it for 15 minutes at 1.8V before any testing is done on it. Note that these numbers represent the best case scenario and should really only be used for comparing one motor or prop to another. Different flight controllers, batteries, wiring and connectors are all going to have an effect on how much current actually gets delivered to each motor. You’re not likely to actually see these absolute numbers in flight. You can view the data from these tests with some basic formatting in this Google Spreadsheet. I used an E010 4-Blade Prop for these tests. MMW CL-0615-19 – Completely insane power, but at 2+ Amps, it will devour your batteries in no time at all. Kado’s Insane 17500kV – These have been my favorite for a couple months now; they’re reliable, have excellent power and give good flight times. Tiny Whoop Special Sauce – Falls right where you’d expect it to at 17300kV. Spintech Sidewinder – This one performs right up there with the Kado’s Insane motors and the Special Sauce motors. These sell for $17 for six motors! MMW CL-0615-17 – This is the minimum that I’d recommend if you’re toting around FPV gear. It’ll give you a pretty good balance between power and flight times (leaning more towards the power side of the scale). Blade BLH8503 – This is the original motor that came with the Inductrix FPV; there are some reports that they’re now using slightly less powerful motors. IMO, it’s barely adequate for FPV. My first thought upon flying the Inductrix FPV for the first time was that it handled like a barge. I really hope that they’re not adding even less powerful motors as part of the fix for the flight-time issues that the Inductrix FPV has been suffering from! Ridiculously expensive! Banggood CL-615 – Pulls slightly ahead of the MMW CL-0615-14, but just barely. It’s advertised as 55,000 unloaded RPM, which should make it a 14800kV motor. Either Banggood has exagerrated those numbers, or it’s a big underachiever! I definitely wouldn’t want to fly FPV gear with this motor! The first CL-615 that I put on the test bench made loud clicking noises, so I tossed it. The results above are with a second CL-615 motor. 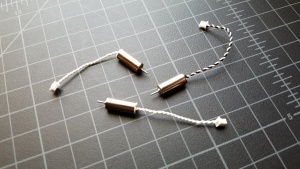 MMW CL-0615-14 – This is a good replacement for the Stock Inductrix motor as long as you don’t plan on hauling around any FPV gear. You’re not going to win any races with this one (tho it does have more power than the Stock Inductrix motors), but you’ll get excellent flight times due to its high efficiency. Blade BLH8703 – This is clearly the weakest of the bunch but it’s very efficient, so you’ll get excellent flight times with it… until you add some FPV gear and make it cry. Ridiculously expensive! I used one of Kado’s 17500kv Insane 6mm Motors for these tests; these are currently my favorite motors. Nano QX – These props provide tons of thrust and are pretty efficient; they still draw a lot of current at max throttle, which means that the motors will probably be pretty hot after a few minutes of flight. 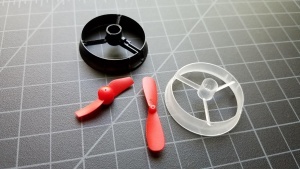 Nano QX 3D (3-Blade) – This prop seems like it’s just too much prop for 6mm motors. It ends up giving less thrust with a higher current draw than the 2-Blade version. My test motor was getting hot just from short test runs with this prop. Not recommended! GW008 – This prop is really efficient. It provides ~2g more thrust than the 2-Blade E010 prop at the same current draw! 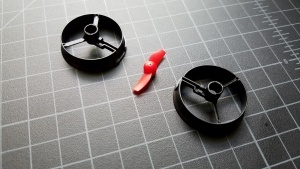 Unfortunately, it’s slightly larger in diameter, so it won’t fit on an Inductrix/E010 frame, but if you’re building a micro quad with 6mm motors, you should give these GW008 props a try. 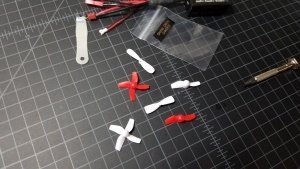 4-Blade E010 – These are a great alternative to the stock Inductrix prop. They’re well balanced and perform just as well, if not better in many cases. They’re also dirt cheap! 4-Blade Inductrix – Almost every stock Inductrix prop that I’ve tested on the setup seems to be slightly unbalanced. This results in oscillations that likely slow down the prop and cause a higher current draw. This is very likely why the stock Inductrix props chatter so much in flight. I played around a little bit with trying to balance them, but gave up… not worth the effort. 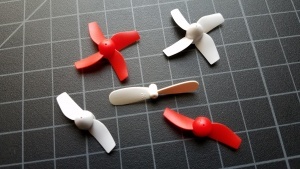 The 2-Blade Inductrix-style props are simply 4-Blade props that have been cut down to 2 blades. I do this with flush cutters and find that I don’t even need to sand down the hub afterwards. They provide a bit less thrust than the 4-Blade versions but draw less current, which will result in longer flight times. I really only notice the thrust difference in extreme situations and think that its a fair price to pay in order to get some extra flight time! Hubsan Q4 – These props are so small that they’re really only going to be useful for the tiniest of quads… such as the Hubsan Q4. I used one of Kado’s 17500kv Insane 6mm Motors for these tests along with an E010 4-Blade Prop. Since I’m comparing duct vs. duct in this group, I rotated the ducts so that the arm of the test stand fell between the struts rather having them rotated so that the arm lined up with one of the struts. I used an unmodified E010 duct for this test. The duct actually does seem to help a bit with thrust, at least with the Inductrix duct. The beefy wire-routing strut in the E010 duct, along with the two 0° struts likely kill any benefits that the E010 may offer. The 0° test was done with an unmodified duct. I then used heated pliers to carefully bend the two normal struts to 45° and 90°. Note that this will definitely weaken the struts and it can also cause the motor mount angle to change slightly; good luck trying to get that motor mount realigned! Bending the struts does results in higher thrust numbers, but the benefit could very well be lost in actual flight if the motors end up being misaligned. Since previous testing showed that the GW008 prop performed a lot better than the Inductrix-style props in free space, I wanted to see how it’d behave if I mounted it above a duct (it’s too large to fit inside the duct). While the Inductrix-style props clearly work better in the Inductrix duct vs. the E010 duct, the GW008 prop performs pretty much the same with either. This is obviously not the most efficient way to use this prop; some of the prop wash has to be hitting the duct and reflecting right back up into the prop, creating turbulence. However, there’s a definite gain in thrust with a lower current draw; more power with longer flight times is always good! Using an Inductrix duct as a guide, I cut down a GW008 prop with nail clippers and then rounded the edges with emery paper. The final diameter is just a hair under 31.7mm. This allows it to fit inside both the Inductrix and E010 ducts. With the current opened up on the bench, the GW008 props perform the same as the 2-Blade E010 props at a lower max current draw. They outperform the 2-Blade E010 props at lower current values; they’re clearly more efficient props. In flight, this should translate to better performance and more air time; xanuser’s flight tests with these cut down props backs this up. These cut down props sound like angry bees!